Guadalupe Apodaca's career is recognized spanning over forty years as an award-winning artist acknowledged by The Pastel Society of America and other awards from juried fine art shows throughout the United States. Born in Fort Collins, Colorado, his artistic abilities amazed teachers and family with accurate portrayals of faces at a very young age. David has always created his own opportunities in business by being an independent entrepreneur seeking to follow the tried and true design/life axioms his predecessors inspired; “Form follows function”, “The site dictates the design”, “Tell the story of the User through the design”, “Put yourself in their shoes”, “Understand your client”, “Listen” as well as many others. As his consulting career enters its final stages, David is passionate about his metal art, including furniture, sculptures and wall art as an outlet for his creativity and knowledge. His hope is to bring the enjoyment of intriguing and positive art into the lives of the viewers and owners of his fine art. David holds a BS Degree as well as a B-ARCH Degree in Architecture, a Master’s Degree in Mediation and Arbitration from the Pepperdine School of Law and has completed Graduate studies in Landscape Architecture and Environmental Planning. He has designed and built numerous unique architectural projects over the last 45 years. He has assisted many design professionals in resolving disputes or issues as they arise in their relationships. Through these experiences, he has begun to combine both design and communication skills into art. 'I have been painting for over 50 years, and have been teaching for over 40. 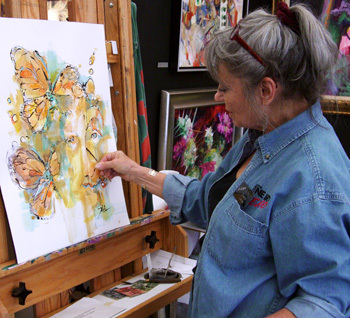 I have taught Drawing, Life Drawing, Composition and Design, Oil and Acrylic Painting, Watercolor, Colored Pencil, Pastel, Color Theory, Print Making and even Sculpture. There have been classes for college credit, adult recreation and open studio. I have taught wise and foolish senior citizens, tentative middle aged adults, emerging young people, and toddlers having their first luscious experience with finger paint. By teaching I share the joy I experience every time I pick up a brush or pencil. I have also owned and operated a full-service commercial art studio, where I did all of the illustration, design and production work. I have cataloged the extensive slide collection for a college Art History department and even done paste-up for a small newspaper. I am currently President of the Scottsdale Artists League, a member of the Sonoran Artists League, and a juried member of Arizona Art Alliance. Recently, I was the cover artist for Images AZ and my piece appeared in Phoenix Home and Garden as the publicity for the show at Anthem. Even as a child playing in the creeks and streams of southern Illinois, Hal would often make small figures from the clay found there, leaving them to harden in the sun. As an adult, his talent was put on hold as life intruded. He served in the U.S. Navy and attended college before moving to Arizona since 1968. He spent his entire working career in sales and service in the construction industry. While still working full time in the construction industry, he owned a small farm and ranch in southeastern Arizona. He also raised show horses in the Phoenix area. As a rancher/farmer, he has irrigated his fields, mowed alfalfa hay, helped with calving, delivered foals, been stepped on by horses, run over by cattle, and performed the many other duties associated with the cowboy lifestyle. He says he is thankful he has retired from that lifestyle! Only after retirement did his love of sculpting reappear. With encouragement from a friend, he produced his first sculpture entitled “Treaty Talker”. The quick selling success of that piece led to his continuation in sculpting. Today, his subject matter ranges from cowboys and horses, to Native American Indians, birds, and animals. Before he begins any sculpture, he does extensive research of the subject to assure complete accuracy. He has met with tribal officials and ranchers and visited wildlife sanctuaries to obtain needed information. In his artistic career, Hal gives generously of his time. For four years he was a volunteer art teacher to incarcerated youths at an Arizona’s juvenile detention center. He has been guest speakers at numerous art clubs and organizations. As a U.S. Navy veteran himself, he is currently involved in teaching disabled American Veterans. In 2013 The Desert Caballeros Western Museum in Wickenburg, AZ honored Hal with a three-month exhibit of his work. In July 2014 the museum added his sculpture “Yaqui Deer Dancer” to its permanent collection. In 2013, Hal was invited to become a member of the prestigious Western Artist of American. The winner of numerous awards, he was selected by the United States Park Service to be the artist-in-residence for the summer of 2005 at the north rim of The Grand Canyon and artist-in-residence for the summer 2014 at Mesa Verde National Park in Colorado. Today, one of his pieces “Chasing Star Kachina” is in the permanent art collection of the U.S. Government and is displayed at the south rim of the Grand Canyon and with their traveling exhibit of Canyon artists. His sculptures are found in private collections, Corporate Offices, and galleries throughout the world. A visit with this interesting individual reveals his optimistic view of the world. Sarge did three tours of duty in Vietnam, 1966-'67-'68. His first tour was eleven months in the jungle/hospital with the 101st Airborne Paratroopers as a combat infantryman. During that time he advanced to Squad Leader. Sarge came down with malaria three times, jungle-rot, immersion-foot, two varieties of internal parasites, a shrapnel wound in his leg, exposure to Agent Orange, and Post Traumatic Stress Disorder which Sarge says is the "Vietnam Blues". Sarge received the Purple Heart, the Good Conduct medal, a Vietnam Service Medal with 1 Bronze Service Star and 1 Silver Service Star (to represent three tours of duty), Parachute Jump Wings, the Combat Infantryman Badge, the National Defense Service Medal, the Vietnam Campaign Medal, the Army Commendation Medal, a Valorous Unit Emblem, a Republic Of Vietnam Gallantry Cross With Palm Unit Citation Badge, and five Over-Seas Bars. Sarge Lintecum is a leading slam poet (performance art poet) in Arizona, and slam master, having hosted The Mary McCann Poetry Slam for over three years. He has been an organizer and national competing member of the Phoenix Slam Poetry Team from 1992, when he competed that year in Boston, to 1996. At the 1994 Annual National Slam Poetry Competition in Asheville, North Carolina Sarge won the Slam Haiku competition making him the 1994 National Slam Haiku Champion of the USA, and inspiring him to write his 160 page book, (1 Haiku per page) "Sarge's Little Book of Haiku". This book was Sarge's second book of poetry, preceded by "The Vietnam Blues and Other Really Radical Writings." (50 pages) Sarge's third book, "Vietnam Vet Will Work For Food" (30 pages) will touch your heart. Arthur was born in Rotterdam. He is a Dutch artist who specializes in depicting motor racing, Land-and-Water speed record breaking scenes, Abstract, Surreal and Science-Fantasy paintings. He resides outside of London, England. Benjamins comes from a lineage of artists. His great grand uncle Jacob J. Arend’s work can be found in the museum Boijmans van Beuningen in Rotterdam. His grandfather created a new style of advertising that formed the bedrock of modern illustrative adverts. From an early age he was fascinated by motorcar racing and in the 70s he started painting Formula 1 cars in his own photo realism style. In the early 80s, he received much publicity through many articles in motor racing magazines and has been featured on TV several times. Benjamins’ technique is different from other artists due to his preference for the far more tricky enamel paints over “traditional” paints. His interest in Land-and-Water Speed record breakers led him to the first of many book jacket covers. In his book Pilote Che Gente Enzo Ferrari included one of Arthur’s paintings. Most of Arthur’s work has been transported to the United States and he has been exhibiting his work in art shows and galleries since Jan. 2013.